Press the Menu button then select Troubleshoot. 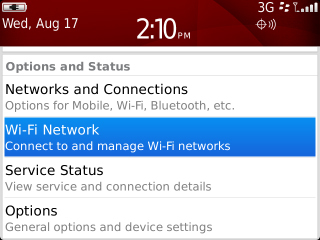 The Wi-Fi Diagnostics tool provides Wi-Fi configuration and connection information for the BlackBerry device. 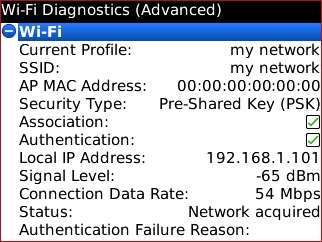 The report that is generated can be sent to the local IT / Network Administrator for assistance with troubleshooting a Wi-Fi connection. 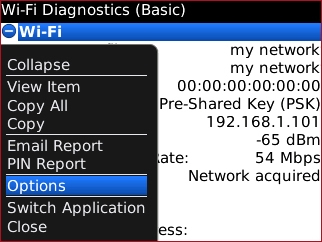 To send the diagnostic information to another party (e.g. 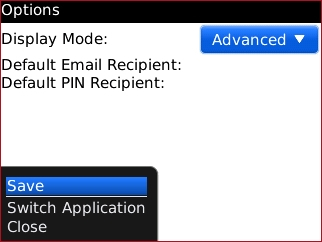 local IT / Network Administrator), press the Menu button then select Email / PIN Report. 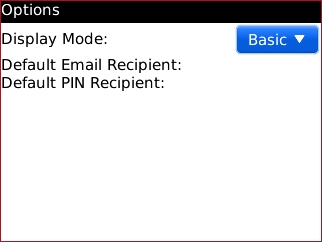 For assistance sending the message, refer to Compose and Send an Email or Send PIN Message then follow steps 4 though 6. 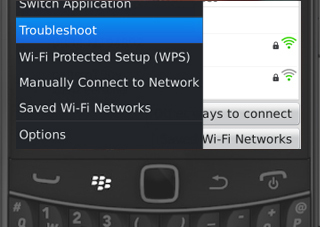 To change diagnostic mode (Basic or Advanced), press the Menu button then select Options. 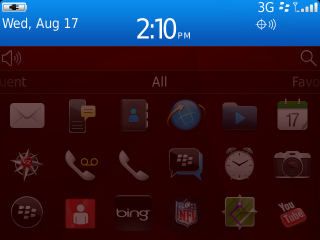 Select the current option in the Display Mode field. DNS Lookup is used to obtain the IP address from a Domain Name System. Ensure a host name (e.g. 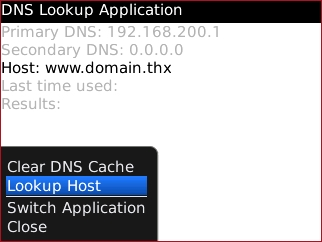 www.domain.thx) is entered into the Host field, press the Menu button then select Lookup Host. 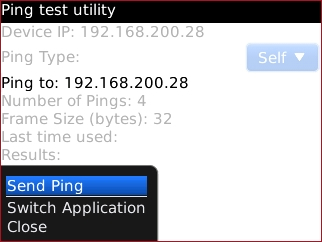 The ping test utility is used to verify connections to remote computers. 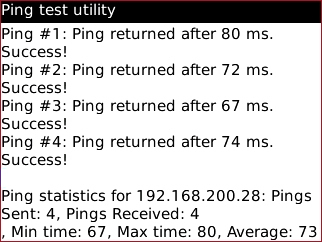 Ping sends out packets of data then waits for a response from the target computer. 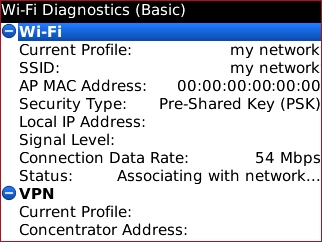 Select the current option in the IP Address field. 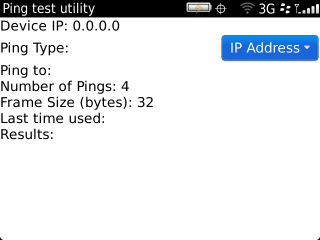 Ensure an IP address is entered into the Ping to field, press the Menu button then select Send Ping. 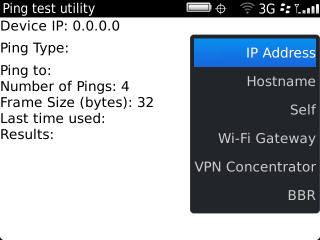 Depending upon the Ping Type selected, the IP address may populate automatically. 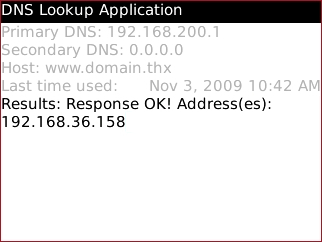 To obtain an IP address from a Domain Name System, refer to DNS Lookup for assistance. 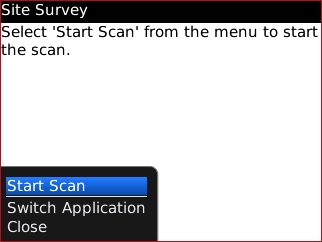 Press the Menu button then select Start Scan. To send the results to another party (e.g. 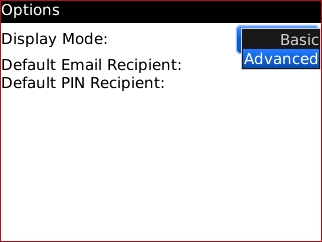 local IT / Network Administrator), press the Menu button then select Send as E-mail / PIN.